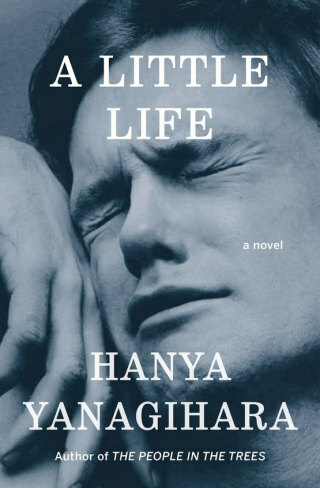 Summary (from the back of the book): A Little Life follows four college classmates--broke, adrift, and buoyed only by their friendship and ambition--as they move to New York in search of fame and fortune. While their relationships, which are tinged by addiction, success, and pride, deepen over the decades, the men are held together by their devotion to the brilliant, enigmatic Jude, a man scarred by an unspeakable childhood trauma. A hymn to brotherly bonds and a masterful depiction of love in the twenty-first century, Hanya Yanagihara's stunning novel is about the families we are born into, and those that we make for ourselves. Review: I am drained. This story and these characters have been haunting my thoughts for about two weeks as I worked my way through the book. It is 814 pages after all. I will be honest and say that I wasn't sure I was going to get through this book: the length was intimidating and the first 30 to 50 pages were slow for me. But all of a sudden I found myself absorbed in the characters. Because, really, this book isn't about the story, but rather about people and friendship. The men in this book, the main four friends and those in their extended lives, care about one another so much it is painful at times. They have history, secrets, and love. To have friends that care as much as these friends do is something we should all be so lucky to have. There are scenes in this book that are not for the feint of heart. Jude ends up being the center of the characters and he has not had an easy life. it takes hundreds of pages for the horrible details to slowly be revealed to both the reader and his friends. But what's interesting is not the details of his experiences, but how they affected his life, his personality, and those people around him. This book is beautiful, I don't really have another word to describe it.